Coordinates: 59°33′48″N 30°6′27″E﻿ / ﻿59.56333°N 30.10750°E﻿ / 59.56333; 30.10750 The Great Gatchina Palace (Russian: Большой Гатчинский дворец) was built in 1766–1781 in Gatchina town (near St. Petersburg) by Antonio Rinaldi for Count Grigori Grigoryevich Orlov who was a favourite of Catherine II. The Gatchina Palace is located on the hill above Lake Serebryannoe. It combines themes of a medieval castle and a country residence. Palace interiors are exemplary of Russian classicism at the turn of 18th—19th centuries. The Gatchina Palace was one of the favourite residences of the Imperial family. This Fabergé egg is a replica of the Gatchina Palace. 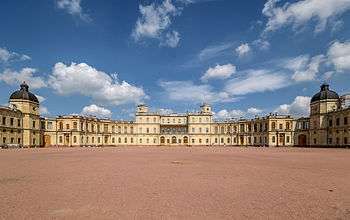 Catherine the Great took such a great liking to the Gatchina Palace and park that, at Orlov's death in 1783, she bought it from his heirs and presented it to her son, the future Tsar Paul I. A remarkable monument of Paul's reign is the Priory Palace on the shore of the Black Lake. Constructed for the Russian Grand Priory of the Order of St John, it was presented to the Order by a decree of Paul I of Russia dated 23 August 1799. After Paul's death the grand palace and park passed to his widow, Maria Feodorovna, from 1801 to 1828. Paul's son, Tsar Nicholas I, was the master from 1828 to 1855. He made the most significant expansion of the palaces and parks, adding the Arsenal Halls to the main palace. The Arsenal Halls served as the summer residence of the emperor. In 1851, Nicholas I erected a monument to his father, Paul I, in front of the Palace. In 1854 the railroad between St. Petersburg and Gatchina was opened. At that time the city of Gatchina's territory was expanded by incorporation of several villages and vicinity. Tsar Alexander II used Gatchina Palace as his second residence. He built a hunting village and other additions for his Imperial Hunting Crew, and turned the area south of Gatchina into a retreat where the Tsar and his guests could enjoy the unspoiled wilderness of northwestern Russia. Alexander II also made updates and renovations in the main Gatchina Palace. Following Alexander II's assassination in St. Petersburg in 1881, his shaken son, Tsar Alexander III, was advised that he and his family would be safer at Gatchina as opposed to at the Winter Palace in the capital. The palace became known as 'The Citadel of Autocracy' after the Tsar's reactionary policies. He lived most of his time in Gatchina Palace. Here he signed decrees and held diplomatic receptions, theatrical performances, masquerades and costumed balls, and other events and entertainment. Alexander III introduced technological modernizations in the Gatchina Palace and parks such as electric lights, a telephone network, non-freezing water pipes and a modern sewage system. Tsar Nicholas II, spent his youth in the Gatchina Palace, although he and his family would make Tsarskoye Selo his home. His mother, Dowager Empress Maria Feodorovna, widow of Alexander III, was the patron of the city of Gatchina and Gatchina Palace and parks. Wikimedia Commons has media related to Gatchina.